Because of WordPress popularity, many web hosts have decided to specialize in WordPress and provide what is called managed WordPress hosting. It is a concierge solution where all the technical aspects of WordPress are managed by the web host. It includes speed, security, WordPress updates, scalability, website up time, and daily backups. The main idea behind such kind of hosting is to provide a fully hassle free experience, in order that you can focus completely on operating your business. One of the most excellent things about managed WP hosting is its premium support. The support is offered by real WordPress specialists having many years of experience instead of somebody reading the support manual. Security: You are hacker proof if you opt for managed WP hosting provider. Blazing Fast: The service of managed WordPress hosting are configured mainly for WordPress. Therefore, the servers are always blazing fast even when you have lots of web traffic. Daily Backups: Managed WordPress hosting creates daily backups and provide restore points when you wish to revert. Export Support: Unlike all other Web hosting providers, you can expect to get highly knowledgeable WordPress staff. The staff can advise you against utilizing plugins that can impact your performance. Dev Tools: Even though it differs from one host to another, you just generally get the Dev tools like version control, staging area, etc. No Downtime: Irrespective of how much web traffic your website gets, the site will never go down probably. Why Should You Opt For Managed WordPress Hosting? If you’re a beginner just starting with a blog, you don’t need managed WordPress hosting. You can simply start with a regular WordPress hosting. Here the few best shared hosting for wordpress. But if you’re a small business or you’ve high traffic site, then you can definitely go formanaged WordPress hosting. So, the decision depends on your needs completely. If you lack technical skills, average hosting can be a hassle for you as your website grows because with any average hosting, you are accountable for updates, speed, security, uptime and more. Being a business owner, you’ve 2 options. Either you can hire a system administrator to manage your site or you can go for managed WordPress hosting. If you wish for something that is hassle free, offers mind blowing support and is blazing fast, you’ve your answer. If your site is your business, then you cannot afford to let it go down. So pay the additional bucks for the outstanding service you will get by opting for managed WordPress hosting. 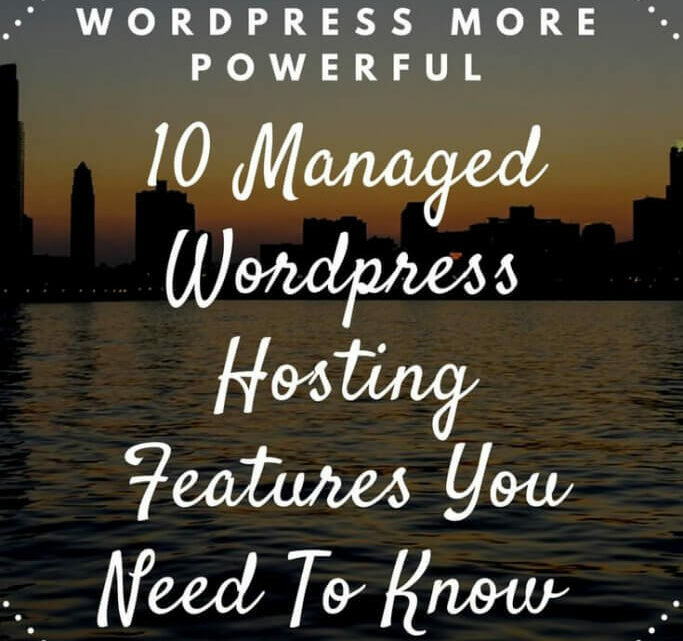 Now that you’ve read about the managed WordPress hosting, so it is time to make a decision. So here is a complete list of the top managed WordPress hosting service providers. 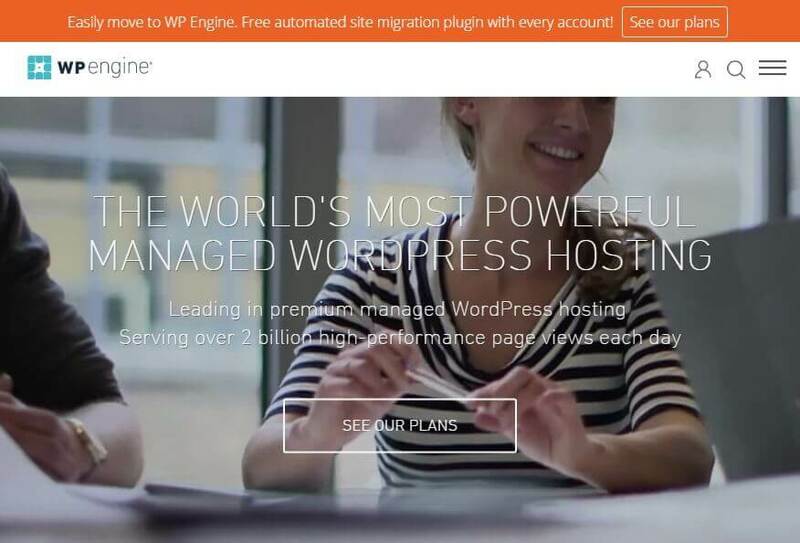 Whether you are complex and intricate Multi website for your brand or setting up your personal blog, WP Engine makes the managed WP hosting simple, secure and scalable for you. If you host with WP Engine, you can get everything you need. This means that you get access to the best of what they have to offer. From their legendary customer service to their industry defining software innovations, they offer WordPress hosting experience which is just unmatched. Enable SSL certificate on any website with just one click and proprietary caching technologies for massive speed and scalability. Every feature of WP engine from staging sites and EverCache to one click SSL and GEOIP, has been built mainly for the WordPress users. They have hundreds of full-time support experts who work around the clock in shifts to help their clients handle difficult WordPress problems. When WordPress core updates and security patches are considered, WP Engine is also proactive in keeping the website safe with automatic updates. They also perform proactive malware and security scans to make sure that the websites running on WP Engine stay free from intrusions. Their tech support team ensures that you sleep easy knowing that there is someone to offer the safest WordPress hosting solutions on the market. Ok, if you want to know complete features read wpengine wordpress hosting reviews here. Nowadays, WordPress can do anything, but as the demand grows, websites should be able to extent with that development, while maintaining best in class uptime, page speed and security. Pagely offers managed WordPress hosting for large businesses on a range of industries. Pagely is the largest pplatform for managed WordPress hosting. They are one of the preferred managed WordPress hosting providers with a decade of expertise and experience. This knowledge translates into a high quality service and product and deeper tribal knowledge which they pass to their clients. They handle all technical aspects of managed WordPress hosting. This means they take care of update to both plugins and core, advanced tuning for performance and optimal speed and proactive security. Pagely is also powered by Amazon Web Services which helps you gain unbeatable performance, scalability and redundancy available to biggest brands across the world. With Pagely, your entire database and site is backed up every day and stored on the Amazon s3. You can restore or download a copy easily. Also read: A2 hosting reviewshere. Other than that, you can leverage the latest when it comes to performance technologies like PHP7 to speed up WordPress. Their modern hosting stack also includes Redis to accelerate WordPress experiencealong with NGINX/OpenResty to deliver unmatched speed. Pagely also has built in Redundancy which means they have duplicated important functions and components of every system in order that in case of failure, mechanisms are there to promptly offer a replacement or backup. You also get real experts who use WordPress daily and who know the in and out of getting the best from an application. 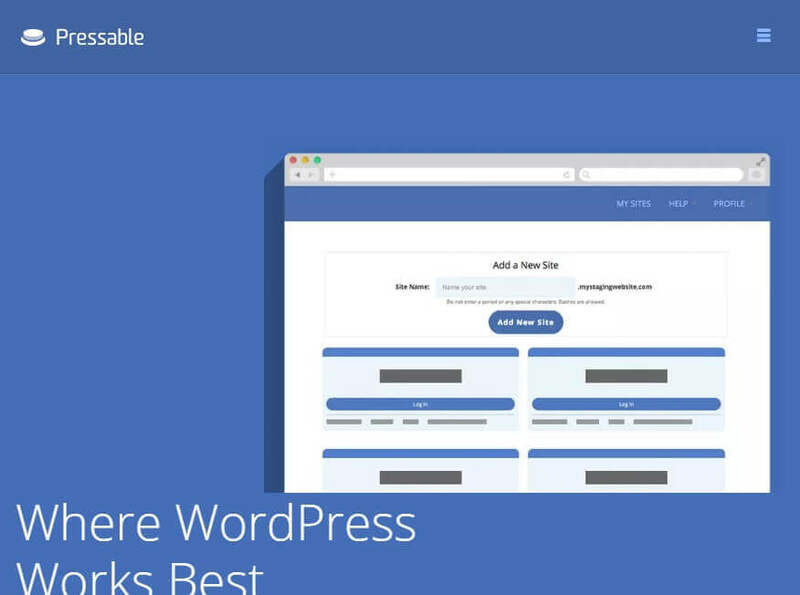 Pressable is a famous Managed WordPress Hosting service provider which is highly adored by most developers and business people. Since their establishment, they have dedicated themselves to offer the best WordPress hosting solutions possible to all the webmasters eager to succeed. Ranging from the startups to fortune 500 companies, Pressable is owned by millions of users. To help the webmasters save energy and time on managing their sites, Pressable offers every customer with simple-to-use tools used to build and manage their websites. Another great feature of Pressable as a Managed WordPress host is daily backups. The company takes complete care of any update related WordPress updates. Well known as the leader in Managed WordPress hosting provider in the industry, they have the great strength to maintain fast loading speed and high uptime. To guarantee best networks connectivity, Pressable uses best technologies and facilities, like malware scanning and removal, intrusion detection system, and server side optimization. All these play an important role for successful site building. Build on cloud hosting giant Rackspace infrastructure, Pressable is a famousmanaged WordPress host which aims to offer superior customer satisfaction. Moreover, it is an affordable solution for the smaller businesses and provides optimized servers, intrusion detection systems and 1-click staging. Their key features include Managed upgrades, daily backups, Intrusion detection, malware scanning, premium CDN for quicker content delivery and dedicated WP expert support. All in all, Pressable offers secure, fast and scalable Managed WordPress hostingwhich works very well for enterprise and eCommerce websites. They are an excellent option for the agencies and developers looking for a robust platform for client’s websites hosting. Pressidium offers the most secure and reliable Managed WordPress hosting. Pressidium uses their Pinnacle Platform to offer enterprise architecture for each account of managed WordPress hosting. User friendly dashboard and free site migration makes development easy with Pinnacle. 1-click deployment from included staging environment allows you to implement changes the instant you are set to go live. They keep data secure with managed web app, bad bots filtering, managed auto updates, constant scanning for intrusions and malware. Pressidium is built with the webscale systems and technologies optimized specifically to deliver unparalleled uptime and availability and incredible speed for WordPress. When it comes to Speed, WordPress takes you past the limit with highly available SSD storage, dynamic load balancing, Geo DNS and CDN support, multi-layer adaptive caching, SSL acceleration, completely burstable elastic cloud, image optimization and lazy loading, PHP opcode caching and acceleration. Pressidium also tops the chart when it comes to uptime and reliability. They have highly available architecture for every layer, automagic scalability, enterprise grade FT scale design, auto-updates and automated backups, 1-click staging websites, etc. Dynamic load balancing, SSL acceleration and adaptive caching support maximum uptime as well as duplicate resources eliminate services interruptions. With each plan of Pressidium, you will get 60 days money back guarantee. All the plans feature Pinnacle platform architecture and unlimited bandwidth. Custom plans are also available for websites that need more installation or handle monthly visitors in millions. If you discover your site needs a change, then you also get the option to upgrade or downgrade. This is a newly launched WordPress hosting service born from a private infrastructure and VIPs of music industry and the billboard on the top ten artists. The servers of 45Air use advanced optimization and caching techniques automatically to make a site blazing fast. It means lesser moving things and parts to configure and much more time to focus on whatever you know the best, i.e. your business. All the sites are completely optimized on fly utilizing mod pagespeed, incredibly quick HTTP accelerators, blasted over CloudFlare WAN Accelerator and piped through Varnish. Being CloudFlare Optimized Partner, we are proud to get you flawlessly integration with CloudFlare, free of charge. When it comes to security and protection of your site, 45Air really exceed the industry standards Intrusion Prevention and Intrusion Detection systems are online always, protecting your site from malicious hackers. Other than that, 45Air also maintains a wide ruleset of mod_security and real time blacklists that stop malicious users and spammers from even seeing your site. 45Air not just can manage and support your site and system’s infrastructure, but also can assist with any WP issue or question you might have. We help you as quickly as possible and reply to all the requests that you’ve with a VIP level priority. To ensure that you never lose a visitor or sales, the team ensures that your site is available always and they offer 100% uptime. With 45Air, you’ll get the support you need to quickly to optimize your website for speed and SEO. 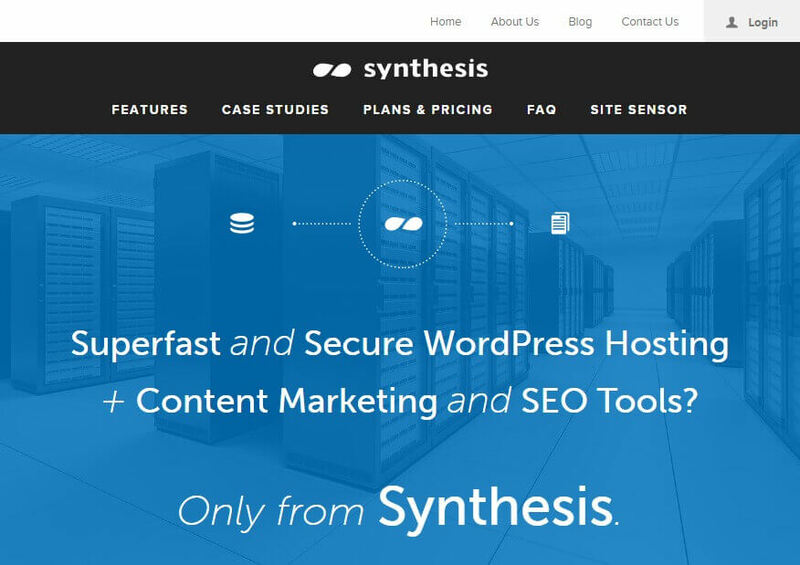 Created by Copyblogger Media, Synthesis is known to be the “Serious Solution for the Serious sites” Synthesis is mainly created for people using Genesis Framework; however Thesis and Woothemes are also supported. When you choose to go with Synthesis, you get custom configuration for the NGINX/PHP-FPM web server that guarantees fast performance, pro domain mapping, CloudFlare Railgun support, free malware scanning & removal, daily backups together with personal backup to AWS S3, server side scanning using securi and 24*7 helpdesk, multisite support and forum. When a site moves to Synthesis and their efficient NGINX architecture, then they experience improved performance with their 99.9% uptime. They have minimalist hosting stack which is configured specifically for WordPress and its exclusive hosting demands. Their architecture is intended to capitalize performance and security, while offering flexibility for the business owners to make their real world decisions ultimately. They follow through proactive monitoring, constantly evolving innovation and patching to stay ahead of bad guys. You can also expect to get stepwise on-page optimization advice along with content development guidance which build website authority and assist your pages to rank well, from the WordPress admin panel directly. With synthesis, you can find out who else possess the audience you wish to reach out and the most excellent ways to create relationships along with content alliances, that too from the WordPress admin panel. Synthesis site sensor provides standard uptime checks that you would expect from any website monitoring service. When you host a site with WPOven, then you do not just get one among the best and the most reliable Managed WordPress host, you also get an excellent team of specialists working for your website. WPOven guarantees you with faster website speed, exceptional support and hassle free hosting for all the WordPress related issues. As the WPOven sites are powered by WordPress, they offer many features for WP site and theme to quickly get you started. What makes WPOven stand out from the crowd of Managed WordPress Hosting providers is its dedicated cloud hosting, speed, support and security; exceptional support, dedicated hardware, premium addons, unlimited sites, worldwide data-centers, clients manager, website clone and sync, billing and invoice; backups, security and firewall and analytics. It’s not only offering super fast WP hosting platform which makes WPOven one of the best managed WP host. They are one among the few and first WP hosts that have set no limit to number of WordPress site install and visit on the server. They also offer free site builder with complete access to the Premium WordPress plugins and themes. No other WP hosts offer a full end to end client manager platform like this for the web agencies and developers. With WPOven, you’ll get many things other than an excellent WP hosting platform like client manager, which is ideal white label solution, recipe builder which deploys any type of website with some clicks only, dedicated server resources and website and server manager, which manages all WP websites and servers from one place. 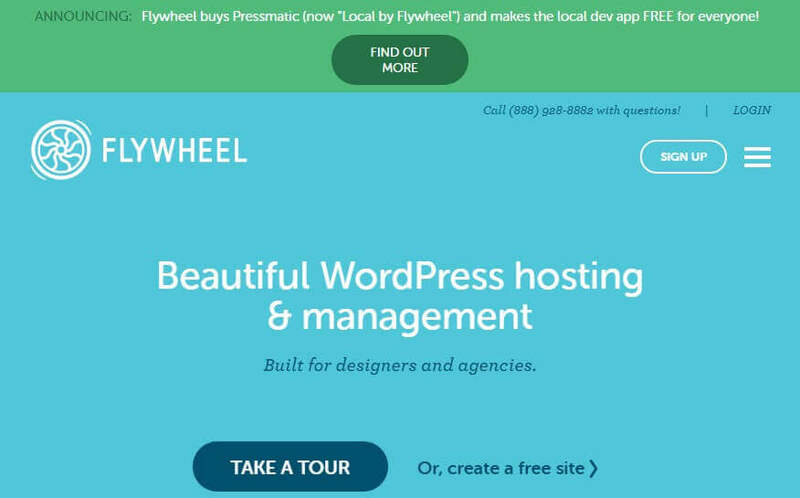 Flywheel was created with both creatives and designers in mind to offer Managed WordPress hosting that suits their needs mainly. It is much more than a web host, and focus on streamlining workflow for the web designers everywhere. A few particularly nifty features of include billing transfer to your clients, staging sites and easy collaboration. You can also manage all the websites from one attractive dashboard. The support team of Flywheel is staffed fully with WordPress specialists, most of whom are experienced designers. Therefore, your largest issues will be always entrusted into capable hands. Flywheel ensures to back up your site automatically each night so that you can rest assured. Designed mainly for the WordPress websites, Flywheel works with lightening fast speed with CDN. They also monitor your site continuously for malware and hacking attempts and can fix any discovered problems for free. With an intuitive SFTP of Flywheel, collaborating with the other designers as well as working on client’s websites has never been simpler. The main advantages of flywheel include easy scalability, fast page load times, super simple to use dashboard, and ability to utilize plugins you need. They also have a qualified staff of the WordPress specialists who can care about all your concerns and needs. With Flywheel you will never need to share password or create many logins again, You can also make changes to your own live website without stress and view all you are working on in a beautiful, centralized place. Presslabs is another managed WP hosting provider committed to publishers that is built to deal with the demand off famous sites with very high traffic loads. They are an adept managed WP hosting provider. Their services are situated across six different data centers across Europe and US. They have all the needed features like CDN, updates of optionally repository plugins & WP core, highly performing NGINX caching layer, unmetered bandwidth and disk space, safe sFTP and email sending, 24*7 services monitoring, WordPress expert support and fully daily backups. With dedicated infrastructure also comes dedicated security. Controlled and immediate core updates, full daily backups and frequent checks makes your choice of Presslabs a great one. They ensure high availability to public using a blend of locations and providers from which your website will be served to the readers. They also have third party tools that monitor your website constantly and convert the malfunctions into support tickets automatically handled by Presslabs engineers. Shared access lets users with account on Presslabs dashboard to get the rights for every website separately with diverse levels of permissions. They offer access to shared websites from the Dashboard’s side menu as with regular websites. The static files and images are served from Presslabs WP-centric CDN, mainly optimized for the media utilized generally in publishing content. Kahuna Host offers the Managed WordPress Hosting service for webmasters looking too quickly upgrade their small sites. They have partnered with the leading and premium theme providers. All their clients get a premium theme and WordPress installation in just one installation. You can get full control with Kahuna Host to utilize other scripts on the website for the things such as forums, eCommerce, membership, forums and all what you require. When it comes to features, Kahuna Host offers premium WP themes for mobile and desktop sites, promise of 99 percent uptime, high speed bandwidth, intuitive editing options and simple layouts for simple customization, automatic updates. Also you get security software patches and daily backups which offer a secure framework for the data storage, users can manage domains, site files, support tickets, billing and more from the admin panel and 24*7 available support desk, ready to deal with any issues users may have. Kahuna Host has dedicated and knowledgeable team dedicated to your own WordPress and Hosting needs. They also offer the option of utilizing Theme Setup service for the webmasters. With this, they install WP, set up a theme, collection of plugins, adds logo and places background image within 48 hours. Moving your site to a new host can be time consuming, error prone and painful if you DIY, but with Kahuna Host you get free website migrations. Kahuna Host keeps your site secure and updated with their automatic updates. 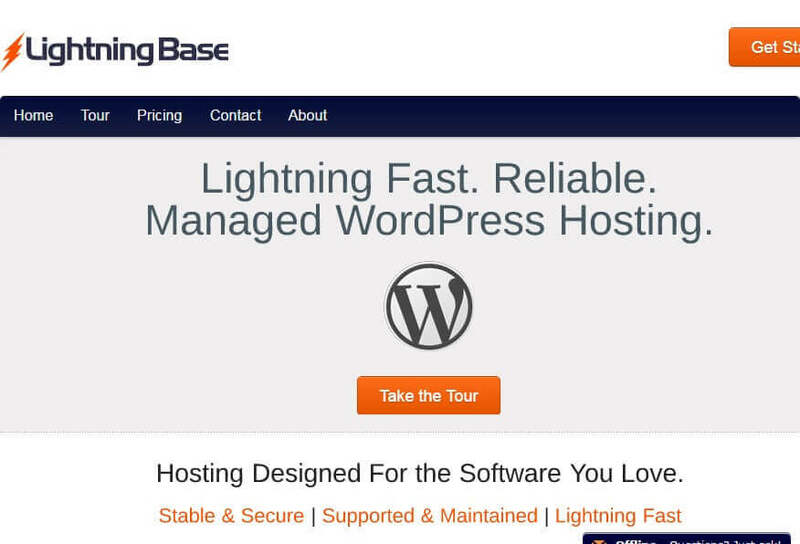 If you require lightning fast speed for your website, then try Lightning Base’s Managed WordPress hosting. They are capable to provide a traditional setup along with great page load times using the Linux based servers that are configured for WordPress only. Lightning base also offers fast page load because of a global CDN, varnish cache and much more. When it comes to security, Lightning base does not lack behind. They offer comprehensive hacking recovery help and firewalls they also take care of CDN, caching set up and site migration. They employ SSD storage, global CDN, opcode cache to offer speed which webmasters need. Their faster speed increases the possibilities of making many sales as the visitors spend more o their time on websites which load promptly. Dynamic firewall is also paired with webapp firewall along with regular security scans in order to provide a secure environment for essential files and site content. They also carry out daily offsite backup which can be transferred easily to your own storage account for great control over security and content. They also add many bonuses like backups, free site transfer, global CDN so that you can save time and your website can fly. They are a perfect option if you’re new to WordPress, are hosting many sites or running a big site. WPCloud is another great Managed WordPress Hosting provider with highly available, real WordPress servers in Canadian Cloud Based network. These servers are created on the self healing architecture. They make use of automatic hypervisor failover in order to keep your website online. With all their servers built around the need for enterprise grade, high performance WP hosting, they offer 99.9% uptime guarantee. They keep your website updated and secure with their hands-on WP updates, optimization improvements, plugin updates and proactive security. They have an expert team which consists of Server Administrators, security consultants and WordPress developers; therefore, they offer you with amazing support which is 100% WP focused. Since speed is very important, they have set up SSD servers to offer varnish caching for all their customers, so you don’t need to fiddle around with the cache plugin settings. WPCloud offers real time automatic backups that are run daily, both offline and online and you get access o their realtime backup system. They do all what is possible to safeguard your website from getting hacked. It includes real time monitoring, scanning and security updates. WPCloud also optimize your photos and accelerate the sites using ultra-fast, robust image optimizer and compressor along with top class algorithms. Their migration specialists move WP website to WPCloud without any addition cost and make it simple for you to get started, without any interruption or downtime to the visitors or clients. Can Affilorama change your affiliate marketing game?